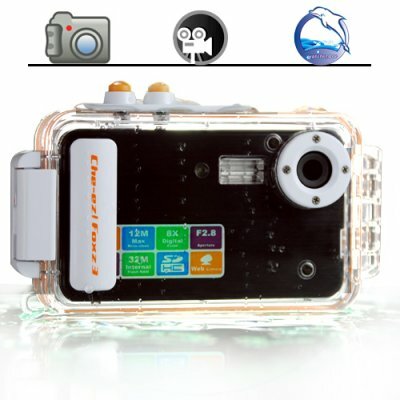 Successfully Added Waterproof 5MP Digital Camera to your Shopping Cart. Brand new black version of our popular DC02 Waterproof 5 Megapixel Digital Camera. This camera takes up to 12MP still photos (via interpolation), videos at a computer friendly 640x480 with 30FPS, and has with a slim profile for a waterproof camera while still having a 2-inch active view screen. This wholesale digital camera is both weatherproof and waterproof. You can take pictures in the rain and also submerse it into the ocean! The photos are saved in a resolution up to 12 megapixels while videos are saved in a computer friendly 640x480 resolution with 30FPS (frames per second). A great factory-direct wholesale price makes this waterproof 12MP digital camera perfect either for the resale market, OEM market, or personal/company use. As always, it is only available from your source for wholesale direct from China electronic products, Chinavasion Electronics. How many pictures can the camera take? The camera can support SD cards up to 8 GB's. If you use the native 5MP setting on fine quality you will get a photo roughly sized at 5MB, which means for each 1 GB of memory you could store 200 photos. So, for a 8 GB card you could store 1600 photos. My camera just came in! It took about 10 days to come in Greece and with the first look it is a very nice product.. I'm looking forward to go to the sea and test it..
great camera prise is great this site is the best. Purchased this camera for my daughter. Beautiful pictures in the pool above and under water. Easy to use and is definitely worth the money. on 2009-05-27 18:45:18 definitely a Gadget! i like the slim, small size of this camera. The buttons are simple and easy to operate in the waterproof housing. The video camera function works good as well.